This is a slender silver solid stainless steel magnetic bracelet. It has shiny silver edges with a textured silver center, and is quite slender at about 1/4" wide. 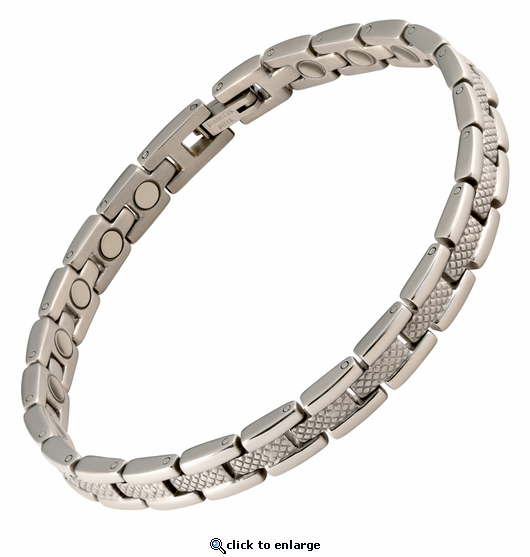 This magnet bracelet has a powerful & permanent 3300 gauss neodymium rare earth north facing magnet in each link. It it has helped a lot! I love my bracelet it has helped a lot & I recommend it to people alot. I am very pleased with my bracelet and will tell people about your product. I ordered my bracelet and it was here so fast. Thank you. It is beautiful. The reviews are what helped me decide to order. I am glad I did. My wrist is 5 1/2 and this bracelet fits perfectly. Not too tight and not too loose. The clasp is very strong. There are 16 magnets in this sized one. It's super comfortable and I sure hope it's okay to take showers with it on. It's very pretty and I hope the magnets work! I love the look of this bracelet. I can fell a difference in my arm and shoulder after I started wearing this. I don't have the pain in my upper arm as much as I did without it. I do sleep with it on and it is ok. My only problem is that I wonder if I will feel better with one on the other wrist and both ankles. But for now I will stick with this one.. Thank you for a good product!! I purchased this for my mother and she loves it. Helps with her pain and is very pretty also. Love it, fits perfect and looks nice. Bracelet looks great has a good clasp. It's keeping my hand from going numb. happy with your product I will buy again. I love my bracelets, I have 3 plus an ankle bracelet. I have corporal tunnel and it truly helps. My mother said it is all in my head. ut I don't care. It keeps my hands from that sleepy feeling and the ankle bracelet does help with my knee pain. I wanted a quality magnet bracelet for a friend. I was very pleased with the quality. It was even nicer than the pictures showed. My friend loved it. Love the bracelet. Within 24 hours I was feeling relief in my wrist and shoulder. I suffer from arthritis throughout my entire body and wearing a bracelet and ankle keeps me almost pain free!!!! I highly recommend for anyone who suffers!!!! This bracelet relieved all of my shoulder pain within a day. I had been trying cheap bracelets from other stores with some relief but not all. It is pretty, comfortable and I wear it with everything. I also shower and sleep in it. I love it so much a friend at work has also ordered one for herself. This company cared enough they called me to double check my small wrist size. I ordered 2 and they both fit perfectly! i tried this magnetic bracelet instead of another brand that I had worn for over year and had alleviated my back pain. I wear this one continuously and have had no relief from the back pain needless to say I am disappointed. the bracelet is attractive but it does not work for me. Reply by MJS: We are glad to accept return for exchange or refund if you wish. Looks much nicer in real life! I had a copper bracelet before, with no links only bendable. This is far superior! Worth the cost, and very Quick relief of my elbow pain. I bought 2 of them, and they were the correct size that I ordered, but too loose for my taste. A quick adjust, removed a couple of links myself, and perfect! I work construction, they have been painted, drywall mudded, tile mastic coated, and quickly clean right up! Awsome product! Highly reccomend! I like this product, I bought it for a bracelet and it is fashionable as well as theraputic. As soon as I put it on I felt the magnet working...weird I know but my skin starting tingling and it felt like the magnetic waves were just working its way down to the bone. I will absolutely be buying again soon! Love the looks and the fit. Great purchase. I purchased these 2 bracelets for my mother. She had purchased 2 bracelets from another company and the only way the bracelet stayed together was with it's own magnets. Well, they kept falling apart and eventually she lost both of them. They also rusted and would peel off the silver layer and she paid double of the cost of these. She absolutely loves the looks of the bracelets. And she told me that she wears them all the time and she doesn't even know she has them on. We have found that magnetic jewlery helps our arthritis so that's all we wear now. And these bracelet #34 do the trick of helping her arthritis, too. Beautiful bracelets!! Well worth the money. Quick and good service from this company. As well, as great quality of the products. Just purchased another bracelet for a male friend with arthritis. This is my 8th purchase from this company. I wouldn't buy anywhere else!!! On a 1-5 I would rate the bracelet a 5.Pain in my wrist and elbow has diminished greatly! I haven't taken it off. The only things I would do differently is order sooner and possibly a bit wider bracelet. I love it! It's stylish, comfortable and it provides relief from aches. What could be better? Very pleased. Shipping was fast and the bracelet has good workmanship and loooks nice. Will purchase again in the future. These magnetic bracelets are great. I also have one for each ankle and my knee pains are gone. I don't take them off at all. These magnetic bracelets are great!! These magnetic bracelets are great!! Thanks for such wonderful service! !